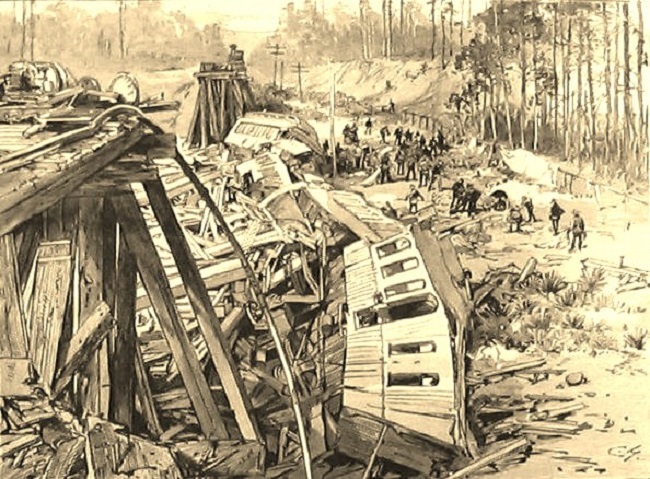 “The Railroad Disaster to the West India Mail near Blackshear, Georgia.” Engraving (from photograph) in Harper’s Weekly, March 1888. For more about this accident, see the Ray City History Blog. In 1855, during the ceremonial opening of a bridge connecting St. Louis and Jefferson City, the structure collapsed and all but one car of a Pacific Railroad train plunged into the Gasconade River, killing more than thirty passengers and injuring scores of others. Among the dead was the father of five-year-old Katherine O’Flaherty, who would later become famous as the writer Kate Chopin. Her mother, Eliza O’Flaherty, suddenly found herself a widow, in mourning but also in sole possession of a large estate that (according to Chopin’s biographer Emily Toth) was worth $25,000, a considerable amount at the time. Four decades later, Chopin would use the incident as the basis for “The Story of an Hour”—but the outcome of her fictional retelling departs from the real-life calamity in a significant, startling way. In recent decades this story (along with “Désirée’s Baby”) has become Chopin’s most famous work of short fiction—but its publication was initially resisted by magazine editors. Toth argues that a tale any more faithful to O’Flaherty’s real-life widowhood “would have been much too radical, far too threatening, in the 1890s,” while the literary critic Sandra M. Gilbert points out that, even in its published form, Chopin’s story “questions the very institution of marriage.” According to the author’s account book, “The Story of an Hour” was rejected by Vogue in April 1894, and during the following months it was similarly declined by Century Magazine, Short Stories, and Chap-Book. This week’s selection was recommended by Jyothi Natarajan, a loyal Story of the Week reader hailing all the way from Bangalore, India. Knowing that Mrs. Mallard was afflicted with a heart trouble, great care was taken to break to her as gently as possible the news of her husband’s death. . . . If you don't see the full selection below, click here (PDF) or click here (Google Docs) to read it—free! The story doesn't cease to amuse me at all.I have read it several times and every time reveled at its great craftsmanship and irony. The sudden death,purportedly caused by "joy" at the unexpected return of Mr. Brently Mallard is what saves Mrs. Mallard 's honor and the myth of perpetual happiness in the institution of marriage. Personal freedom is sacred to any human being and should be respected as inviolate. And Louise suffocated by marital love is overjoyed that the accidental death of Brently has at last set her free. But ironically her relief is short lived. I would like to know how the original story ended. I wonder if the author killed Louise in order to save the facade of respectability of marriage. I would like to thank LOA for publishing the story.